First time I have ever heard of this. Very informative piece. Now I have to find some because I need to know what it tastes like. What a fascinating and informative article. Thanks. How does it taste? I mean, what are its flavors reminiscent of? Is it in the "maple" flavor family? How curious! I've never heard of this before and we have tons of shagbark hickories here in Michigan. That tree has edible nuts too. Very cool article! Here at Turkeywoods Farm (Turkeywoods is one word) we do it a little different, and strive for a formulation that is very similar in sugar content to maple syrup (much different flavor however). Now you need to try making our exclusive hickory nut syrup (it's more difficult and a very different flavor). Goodluck! John - Thanks for the correction to the name of your business; I've edited the post to get it right this time. I'm looking forward to getting down to the coast soon so I can pick up a couple of bottles of your syrup. Dave, If you contact me at syrup@turkeywoodsfarm.com I'll send you a bottle of our hickory NUT syrup. It's lighter and the flavor has no resemblance to the shagbark syrup. I'm interested to hear what you thin of it. It is hard to beat the shagbark flavor, but the nut syrup is my personal favorite. 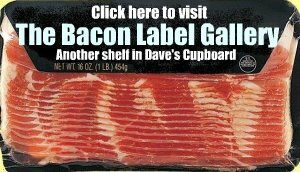 I just made up a batch of hickory cured bacon using this syrup. It came out awesome. We dont have shagbark hickory around me so I will resort to buying it on-line. I'm gonna try the company in CT next time I need it! This recipe works wonderfully! The tricks I didn’t know was toasting the bark first and not boiling it. 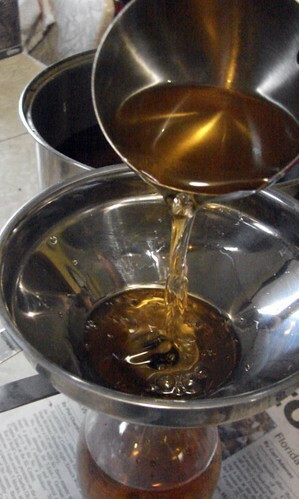 Here’s a nice twist for you: Instead of using water to simmer the bark, use maple sap. (It’s only 1/40th syrup) I have gallons of it at this time of year and it added just the slightest extra “niceness” to my second batch. Thanks for the recipe. Wow, this looks a lot easier than I thought it would be! I will have to try it. When is the best time to get your bark? Thanks for explaining your process. Jonathan Staddon - The tree sheds its bark all year round, so any time you happen upon a tree is a good time to collect bark. Just don't pick up the stuff that's all punky from sitting on the ground a long time. Peeling the bark from the tree isn't recommended - not because it will directly harm the tree, but because it can expose soft underlayers that can give insects a chance to burrow in and do some harm. I'm also told that using the nut shells improves the flavor of the syrup, but I haven't tried that. Yet. Thank you so much. I'm heading out to pick up some bark in my hedgerow in Gettysburg Pa right now. Thank you so much for sharing the great recipe and article. I appreciate the pictures too. Thanks for sharing this! My husband found your article ... we have some shagbark hickory trees on our farm, and my husband wants me to try my hand at making this syrup. We'll see if I'm brave enough to give it a go!! Can you make jelly instead of syrup? The liquor was possibly slightly darker under 15 psi, but there was definitely no noticeable difference in bitterness. All made a wonderful syrup. By cane sugar do you mean the white sugar available in 5lb bags? Should raw cane sugar be used? I've now used your recipe three times, and every time it has been a success. My husband is hooked on Shagbark Hickory Syrup! My father loved it when I made him a Shagbark Hickory Creme Soda with the syrup, seltzer/soda water, ice, and a small splash of real vanilla extract. YUM. It's simple syrup, Dawn. 50 calories per ounce. I've made 3 half gallon size batches. Two are fine, meaning they were put in sterilized, sealed bottles with no air space and capped after the liquid cooled. The 3rd batch after 2 weeks had fine threads of something cloudy running thru the top of it--which then turned into what looks like the small, grey, round maple syrup type mold. I've dumped this spoiled batch out and will make again, but any clue what went wrong? has this happened to anyone else? I used same measure of sugar to "extract" and same bottling procedure was used. Can this syrup be "canned" ie processed in a hot water bath to ensure it will keep for at least a year? Or will the boiling water bath ruin it? Thanks for any advice and for putting the photos and instruction on the web! Oh boy! I love hickory nuts for baking, and last year was a banner year for them here in upstate NY. I gathered about 7 or 8 GALLONS of the nuts under my next-door neighbor's tree, and still have most of them: dry, clean and in good condition, in their shells. Question time: For hickory nut syrup, do you use the entire nut (sans the outer husk), or the empty shell, or the nutmeat? Would using the green husk be a benefit, or give the syrup a nasty, strong, bitter flavor? Does the nutmeat/whole nut get toasted like the bark? Does breaking the nut-shell but not removing the nutmeat help impart the desired flavor? There are lots of hickory trees in my rural area. Anyone living in areas that don't have hickories can contact me and arrange shipment of bark pieces via USPS Priority Mail flat-rate box... your cost, plus $5/lb for my collecting, cleaning, drying, packing, getting it to the PO and sending it. The nuts are pretty heavy, but I could do some of them, too - until I run out! There should be a good crop next year - this year there were very few, and my neighbor says they have a 2-year cycle like that. I hope this isn't against blogger policy - I've never been on here before. Thank you, Dave! This information is great. So nice to know how to make shagbark hickory syrup. With great photos to create a visual. Really want to thank you for these instructions. Tried Hickory Syrup for the first time while at the garlic festival in Mystic, CT. 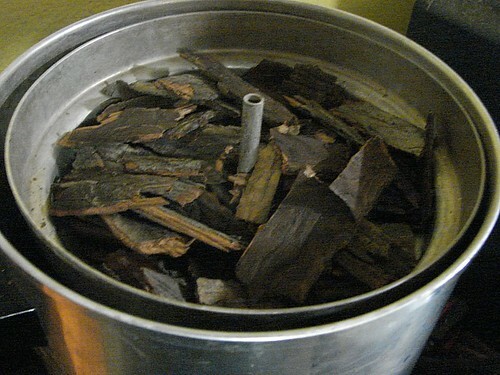 I have since started a quest to find some bark to figure out the secret recipe on my own but with these instructions, I can simply enjoy the flavor of the syrup without screwing up a number of batches to get it right. This is great -- now I don't mind quite so much that the squirrels keep eating all the nuts before I can get to them! I'm planning to try my first batch in a day or two. In response to the person who asked about mold, 2:1 simple syrup can develop mold, although usually after several months; 1:1 will do so after about a month, even in the refrigerator. (I honestly don't know why your other batches didn't!) 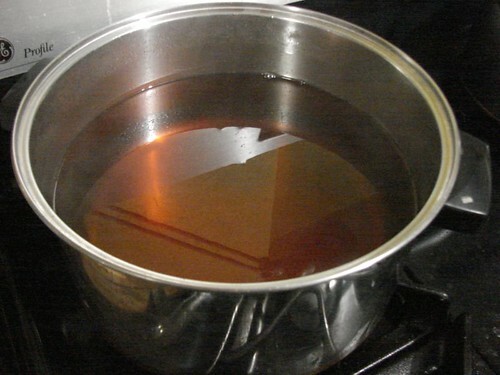 To make 2:1 simple syrup shelf-stable, boil in a pinch or two of cream of tartar for about 20 minutes during the boiling process (I don't know if a specific quantity is necessary, though). You can find some at HickorySyrups.com in the varieties original, organic, and apple cider.
" Ingredients! The classic simple syrup ratio is 1 part water to 1 part sugar, in other words: 1 cup sugar. 1 cup water." I use the 2:1 ratio because it makes a richer syrup, and is more resistant to mold. How much water do you use when covering the bark? Say you have about 1/2 kettle of prepared bark. How much over the top of the bark do you fill (the pot) with water? Suzie, I use just enough water to cover the bark. i have done it. it is very good. 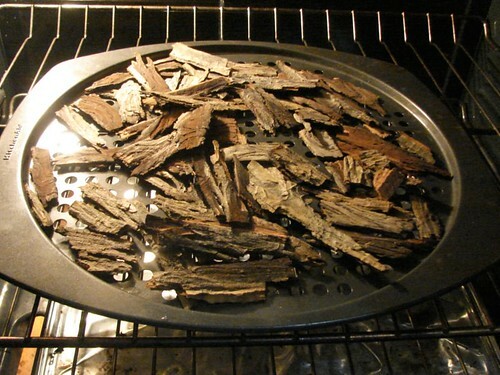 put some of the roasted bark in some good alcohol and it adds flavor too. 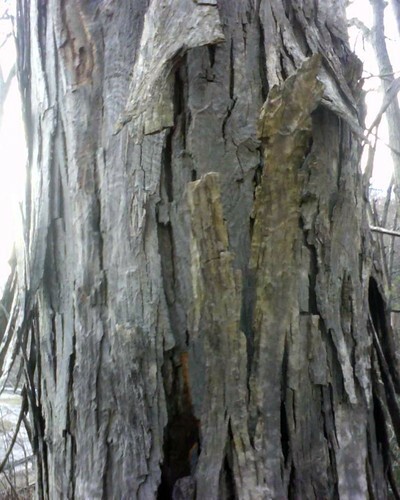 Is it possible to use the bark from a shellbark hickory if I don't have shagbark on my property. I would really like to try and make this. I have seen one comment on another website that mentioned it was possible but there were no clear instructions. Has anyone here ever tried another species of hickory? I have lots of shellbark and pignut but no shagbark. I ordered hickory syrup from Back Creek Farms in Virginia and it’s wonderful. It tastes like autumn smells in the woods, only a little bit sweeter. It’s a treat. Eating some in my oatmeal as I type these words. We've made this for a few years and this is the base for our method. We toast the bark at a lower temp for a little longer and barely let the water move when on the heat. Something to think about as an addition is vanilla bean in each jar. Good stuff.